“Powers of Ten.” To see it, click here. 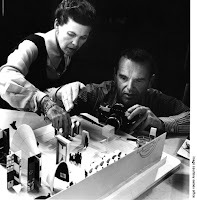 Charles and Ray Eames set and filmed “Powers of Ten.” on Chicago’s lakefront, near Soldier Field. There ought to be a marker to it on that spot, a monument. At least one of these Eames walnut stools. With others in a circle around it. I spoke of this idea last month at the Eames House in Pacific Palisades with the lovely Eames granddaughters Llisa and Lucia. They gave it a “ten.” Each. Wouldn’t 10.10.10 be the perfect day to inaugurate the monument? Thanks again to the USC / Annenberg Getty Arts Journalism Fellowship for the visit to the great Eames House in Pacific Palisades. Pacific Palisades is also where one wealthy software mogul used to getting what he wants reportedly wanted to move the Farnsworth House when it was for sale a few years ago. You are currently browsing the archives for the 7-7-07 category.